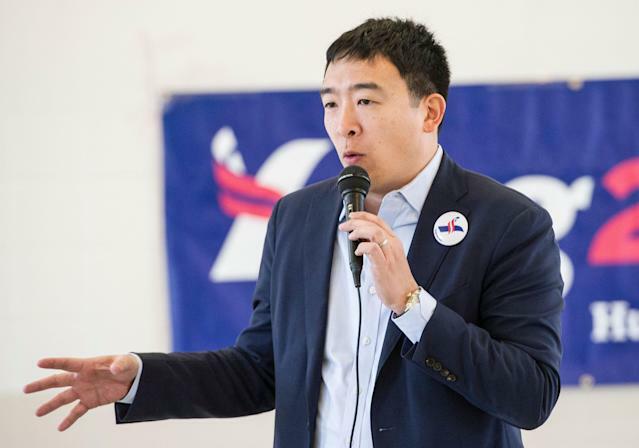 Andrew Yang believes so strongly that college athletes should get paid that he’s made it a policy position of his presidential campaign. On that page, Yang lays out the idea that athletes who help generate revenue for their schools — like football and men’s basketball players — should be given the opportunity to get some of the revenue their schools receive from sponsorships, television deals and conference payouts. The proposal would be a sweeping overhaul of the NCAA’s amateurism model and significantly change the way that college athletic departments operate. It’s an overhaul that would be staunchly resisted by the NCAA and member schools. Any chances of immediate success are lesser than a snowball in hell. The same may be said about Yang’s likelihood of becoming president in January of 2021 too. Unless you’ve been paying close attention to the Democratic Party’s primary process ahead of the 2020 presidential election, you likely hadn’t heard of the entrepreneur until you read his name above. But the underdog candidate has generated a passionate following on social media platforms after he expounded on those myriad policy positions — like a basic income of $1,000 a month for all American adults — on Joe Rogan’s popular podcast. And he just crossed the 65,000 donor threshold earlier in the week, meaning he’ll be on the Democratic primary debate stage if he gets above one percent in a few polls. If Yang gets to the debate, the topic of compensating college athletes isn’t likely to come up. Though the fact that a potential presidential debate participant has simply staked out a policy position against the NCAA’s current construct is another sign of the evolving attitudes towards paying college athletes. That evolution is showing signs of being bipartisan, too. It’s also making incremental progress in the United States court system. Just last week, Rep. Mark Walker (R-NC) said he was going to propose a bill that would allow athletes to profit off their names and likenesses via endorsements and other forms of outside income. While Walker’s bill wouldn’t impact athletic department budgets, the NCAA said in a statement Thursday afternoon that it felt his efforts were “unnecessary” because there aren’t that many players who would make money from it. The NCAA has long used its tax-exempt status and the concept of amateurism as a way to defend its rules prohibiting college athletes from getting paid a salary beyond a cost of attendance stipend or profiting off their likeness. Athletic departments, many of which don’t generate enough annual revenue to match their expenses, would have to overhaul their budgets to pay players a salary. Yang said he’s open to ideas like what Walker is proposing, but wants to go even further than paying players and strip conferences and athletic departments of their tax-exempt status because they’ve essentially become businesses. Given the NCAA’s opposition to Walker’s bill, you can imagine what it thinks of Yang’s vastly more far-reaching ideas.